Tomorrow morning our family leaves for a weekend in Minnesota to attend my nephew’s wedding. Since my sister is much older than me, my nieces and nephews are closer to my age and I have always been very close to them. 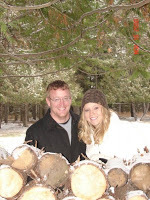 This weekend, my nephew Eric is getting married to the love of his life, Ericka. (I know, Eric and Ericka, how cute is that?) I wasn’t sure Eric would ever get married because one of his great loves is football. He is a football coach for a college in Minnesota and loves football, fishing, and now Ericka. I have met Ericka a few times and she is independent, beautiful, funny, and bright. She hopes to be an ophthalmologist soon! I can see how well Eric and Ericka “get” each other and I believe there is a great future ahead for them. Our daughter Reagan is the flower girl this weekend and son Bennett (who is Eric’s godson) is the acolyte. As a mom, I am a little nervous to have Reagan walking down the aisle, but I know how very excited she is to wear her “Cinderella” dress and drop the petals. Bennett is taking his candle lighting very seriously and is very excited to wear a tux. So, today I am packing, cleaning, and making lists to make sure I don’t forget anything! I know this will be a fabulous weekend full of many memories, laughs, and tears. I just have to get through today first! Have fun! We'll be thinking of you and praying for a very safe trip!